Sean Smith is an Associate Professor in the School of Earth and Climate Sciences at the University of Maine with a joint appointment to the Sen. George J. Mitchell Center. His research seeks to understand processes that shape the earth’s landscape with attention to alterations of hillslope and stream conditions by human activities. Much of his work is within the disciplines of watershed geomorphology, hydrology and surface flow hydraulics to focus on the quantification of landform stability and the flux of water, sediment and nutrients in the contemporary landscape. A primary goal of his research is to advance the prediction and mitigation of environmental impacts across varied spatial and time scales. His interest in developing scientific information to guide watershed management policies inspires his efforts to communicate research results to stakeholders in varied community and physiographic settings. Dr. Smith is currently involved with multiple stakeholder driven research projects in Maine. These include a project initiated by Maine’s Sustainability Solutions Initiative focused on stream dynamics affecting freshwater flows in tributaries draining into Sebago Lake in southern Maine. For the past three years, he has been involved with a stakeholder driven research project that focuses on the scientific basis for decision-making in coupled socio-biophysical systems. The decisions under consideration are rules for closure of public beaches and shellfish harvesting areas in response to bacterial pollution problems. The related research involves quantification and comparison of small watershed characteristics driving the sources, delivery and residence time of runoff related pollution along Maine’s coast. 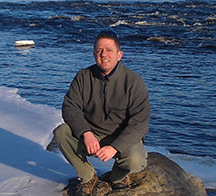 Most recently, Dr. Smith is co-PI with collaborators at the Universities of New Hampshire and Rhode Island on a stakeholder driven research project examining the future of dams in New England river systems. In addition to his teaching and research activities in Maine, Dr. Smith has experience working on watershed process and management research questions on the West Coast and the Mid-Atlantic region of North America. His ongoing work includes extensive collaboration with partners involved with the U.S. EPA Chesapeake Bay Program. He has been published in multiple peer-reviewed publications including Geomorphology, Frontiers in Ecology and the Environment, and Water Resources Research. J. Peckenham, D. Hart, S. Smith, and S. Jain. 2012. “The Path to Water Resources Solutions”.Maine Policy Review, Water Resources, SSI Vol. 7, 2/24/12 (2012). S.M.C. Smith, P. Belmont, and P.R. Wilcock. “Closing the Gap Between Sediment Budgeting, Watershed Modeling and Stream Restoration”. In Stream Restoration in Dynamic Systems: Scientific Approaches, Analyses, and Tools, eds. A. Simon, S.J. Bennett, and J.M. Castro (Washington, D.C.: American Geophysical Union, Water Resources Monograph, 2011). D.J. Bain, S.M.C. Smith, and G. N. Nagle, “Reservations about dam findings,” Science 321, no. 5891 (2008): 910. L.S. Craig, D.C. Richardson, M. Palmer, E. Bernhardt, B. Bledsoe, M. Doyle, B. Hassett, S. Kaushal, S. Smith, and P. Wilcock, “Stream Restoration Strategies for Reducing River Nitrogen Loads,” Frontiers in Ecology and the Environment 6, no. 10 (2008). S. Smith and K.L. Prestegaard, “Hydraulic Performance of a Morphology Based Stream Channel Design,”Water Resources Research41, no. 11 (2005).